A versatile means of handling a variety of products throughout your facility. 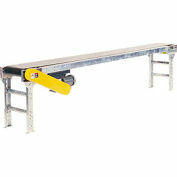 Ideal for use in assembly, sorting and inspection. 3-1/2"D x 12 gauge galvanized steel slider bed has black friction surface PVC belt. Includes permanent adjustable leg supports that adjust from 34" to 38" H for added convenience. Standard 60 FPM non-reversing belt speed. 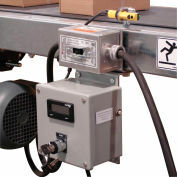 Totally enclosed 1/2 HP, 115/230V, 60 Hz single phase motor. Includes 8 ft. power cord and on/off switch for 115V use. Quality features include: crowned and fully lagged 4" drive and tail pulleys with 1-3/16" dia. shafts, 2-1/2" dia. snub roller and 1.9" dia. return rollers, and pre-lubricated, self-aligning ball bearings. Reversible conveyors and replacement parts are available; call for information.